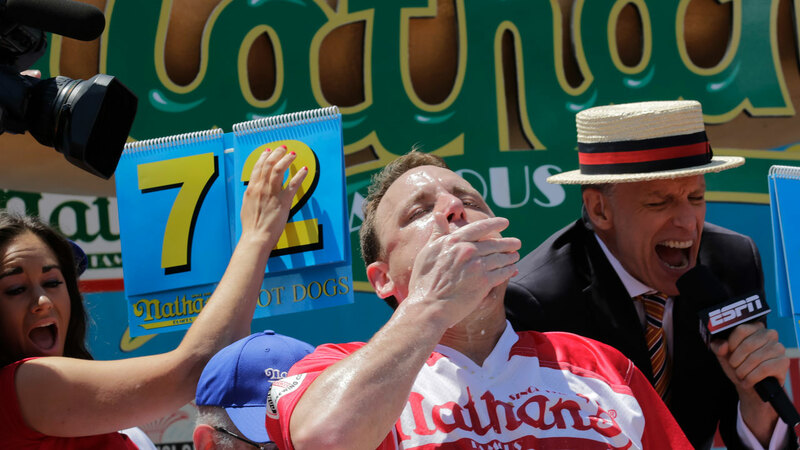 NEW YORK -- The Latest: Joey Chestnut scores his 11th Nathan's Famous Hot Dog Eating Contest win, breaking a world record by swallowing 74 hot dogs in 10 minutes. Judges originally reported that Chestnut only ate 64 dogs. ESPN's Darren Rovell reports that's about 22,200 calories of franks. "I was enjoying the food," Chestnut said, full of 74 hot dogs. For the fifth year in a row, Las Vegas super eater Miki Sudo took top prize at the Nathan's Famous July Fourth hot dog eating contest, downing 37 franks and buns in 10 minutes amid stifling humidity at the annual seaside competition. Sudo fell short of the 41 hot dogs she consumed last year but still beat out second-place finisher Mischelle Lesco of Tuscon, Arizona, who chowed down 28 wieners and buns. On the men's side, 10-time winner Joey "Jaws" Chestnut will confront 20 other men for the coveted Mustard Belt later Wednesday. Sudo, 32, was a fan favorite, drawing big cheers from the crowd during her performance, which was slightly delayed after she requested new water to soak her buns. George Shea, the longtime host of the annual Brooklyn eat-off, quipped that Sudo was particular about the temperature and amount of water she uses while competing.